We offer a full line of maintenance services from basic lawn cutting to working with you to put together a detailed plan for the care of your lawn and landscaping. 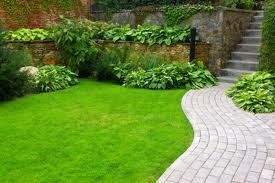 We offer free design services for simple landscape plans. If that doesn't meet your need we have access to a landscape architect who can do a more detailed plan. From a simple bed of shrubs and flowers to an elaborate brick paver patio we do it all. From simple one day projects to new home landscape installations. We offer competitive pricing on all your plant needs. Hard to find trees/shrubs? Call us we can get you on the right track. We can care for all your pond needs from additives to pond plants. If cleaning and maintaining your pond or water garden gets to be too much we can help. Huge variety of pond plants and accessories to give your pond a natural look! Complete from design and plan, to constructing your custom pond. We will design and build the waterfall of your dreams! We also supply a wide variety of ledge rock and other waterfall building materials for do-it-yourself projects! Lawn fertilization and pest management. Our technicians are train and certified through the state of Michigan to give your lawn it's best possible care. Call us for all your snow plowing and salting needs this winter. 24 hour service is the standard with over 30 years experience.